Millions of printed circuit boards are manufactured that are never cleaned following solder reflow. This is especially true in consumer product electronic assemblies, primarily to save money. Inert, non-corrosive flux residues are left on the boards and do not cause problems. By virtue of the fact that the boards are not cleaned, it can be said the fluxes used are no clean fluxes. However, in recent years the term no clean has come to refer to a type of flux specifically designed so flux residues are minimized. No clean fluxes generally have the same aggressiveness as RMA fluxes. 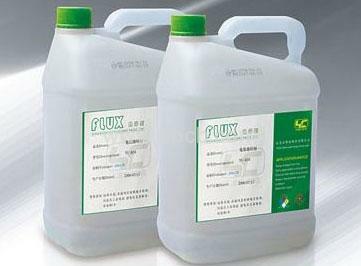 Lower residue is achieved in no clean fluxes by using lower solids content than in other fluxes. Solids content refers to the ratio of solvent thinner to solid component in the flux. A typical no clean flux now has less than 15% solids, compared with 50% in other types of flux. Since the solids in a flux are the basis for its effectiveness, reducing the solids content tightens the process window for no clean fluxes. Flux density control thus is more important than with other fluxes. No clean fluxes can be either rosin or resin based. The most noticeable difference is that rosin based no clean flux produces a thin layer of sticky residue that can be removed if desired. Resin based no clean flux produces a thin residue that is hard and not sticky, but cannot be removed by water or other solvents. This can occasionally be a consideration if rework is necessary. Nitrogen gas inert atmosphere solder reflow is often helpful when no clean flux is being used, especially when it is used with fine pitch surface mount devices. Nitrogen gas eliminates oxygen from the heat chamber of the reflow oven so that oxidation is minimized.